Rest, relaxation and a rejuvenation of body and spirit is the order of the day in Gloria Palace San Agustin Thalasso & Hotel. The location in laid back San Agustin (approx 2 km from Playa del Ingles) is the ideal environment for the unwinding to begin. The hotel is spacious, enjoys lovely sea views and has staff who create a welcoming and friendly atmosphere. The thalassotherapy centre (7.000m2) is simply an oasis of wellbeing where matters of health, comfort and pampering are paramount. The hotel's facilities are excellent and include tennis, indoor and outdoor pools, kids club, free WiFi, archery, rifle shooting, petanca, shuffleboard and table tennis. The indoor pool in the thalasso centre (15+) is for the "get in shape" circuit. The main restaurant is buffet style; the top floor a la carte "Gorbea" restaurant serves international cuisine or relax in the Gorbea chill-out terrace, lobby bar or snack bar terrace beside the tropical garden. As well as 2 adult and 1 kids swimming pool, a third pool (ages 16+) on the top floor and a separate nudist area (sun loungers at nominal charge). A free shuttle bus operates to Maspalomas and Playa del Ingles 6 times daily. Rooms are well equipped with twin beds, air conditioning, safe, TV, free WiFi, phone, minibar (on request), hairdryer, fully appointed bathroom and balcony or terrace. Rooms are on half board basis, but All-Inclusive basis is available at a supplementary charge. Please note that the Thalasso Gloria Center, located at Gloria Palace San Agustín, will remain closed from the next 01/05/2019 until the 31/10/2019 (both dates inclusive) due to improvement and modernization of its services and facilities. * Some facilities may incur a local charge. ** Transfer time from Las Palmas airport is 30 minutes. 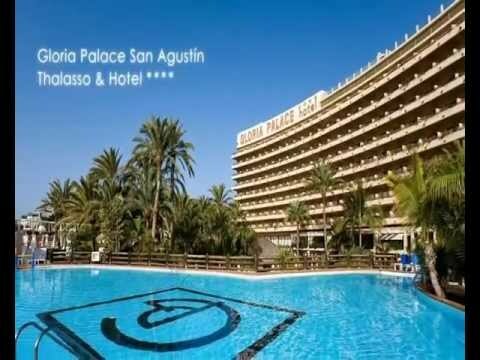 Jacinta says: "The amenities offered by Gloria Palace San Agustin Thalasso & Hotel are very comprehensive. The hotel setting is lovely and the thalassotherapy centre is top quality with wonderful treatments and facilities. A lovely choice for a truly relaxing break in very attractive surroundings." San Agustin holidays - At the quieter end of the spectrum on the southern shores of Gran Canaria, San Agustin is one of the more established resorts on the island. In fact, this was the very first touirst resort to spring up on the entire island! A more tranquil and relaxing option than near neighbour, Playa del Ingles, the resort has its own appeal. In fact, San Agustin holidays can be quite idyllic. Almost marking the beginning of a wonderful golden arc of soft sandy beach, the waters here are safe and shallow and many of the large hotels (for which San Agustin is renowned) have their own little private beach area cordoned off. Watersports enthusiasts will enjoy the various activities on offer and the promenade which runs the length of the beach is tailor made for the requisite evening "rambla". Known to be an upmarket resort, San Agustin is host to a great number of high quality hotels and there are even 2 casinos here. A delicious selection of restaurants is also available where delectable local dishes of "gambas al ajillo" or "papas arrugadas" are the speciality of the house and there are a couple of commercial centres with a wide range of shops, cafes and bars. San Agustin is recommended as a relaxing and more restful option than Playa del Ingles, but yet has proximity to wild nights and vibrant nightlife only a couple of km away. Enjoy the best of both worlds in San Agustin and make your Gran Canaria holiday a memorable one! There are regular flights to Las Palmas which operate year round. Check out our great selection of hotels in the other Gran Canaria resorts of Puerto Rico, Mogan, Playa del Ingles and Maspalomas.